USA (MNN) — Do you know who your Deaf neighbors are? There is probably a Deaf community closer than you think. However, it can be difficult for hearing people to know how to engage the Deaf. There is a language barrier and even a cultural barrier between the hearing and Deaf communities. JR Bucklew, President of Deaf Bible Society says despite these challenges, Christians have an obligation to reach the Deaf with the Gospel. To answer that question, he offers some key strategies we can employ to engage, build relationships, and share Jesus with our Deaf neighbors. First, to engage our local Deaf communities, we need to identify who the Deaf are in our communities. Deaf Bible Society has an online search tool called Deaf Church Where that identifies local Deaf churches and ministries across the United States. 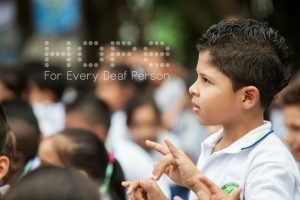 From there, you can contact these churches and ministries and ask about the needs in your local Deaf community. You can also do some investigating in your own church, university campus, or community center and ask about Deaf outreach opportunities. Bucklew says it’s important to have more people asking questions and talking about the Deaf to raise awareness. 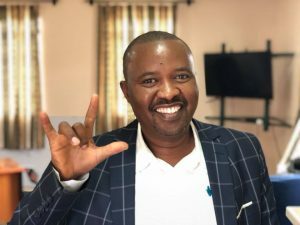 When we identify the Deaf in our communities and work to improve Deaf accessibility, it increases opportunities for hearing and Deaf Christians to connect with Deaf neighbors and share Jesus with them. Bucklew also emphasizes that in order to reach the Deaf with the Gospel, we need to engage them with humility. “You can’t serve your neighbor well if you don’t know who they are, you don’t know where they’ve been, and you don’t know what their needs are. When we assume things, that’s when we always have those bad relationships with neighbors, right? We assumed that this is what’s going on in their life, and it wasn’t. The same applies to Deaf people in our communities. Instead of making assumptions, Bucklew suggests getting to know our Deaf neighbors by asking questions. Finally, engaging a new community of people can be intimidating. However, Bucklew says when it comes to Deaf outreach, don’t let fear stop you. “The fear of you don’t want to be an inconvenience and maybe someone else is already doing it — that’s just part of the learning process. Engage! Make a phone call. Send an email. You making a phone call to the Deaf pastor is not going to be a hindrance in any way. The technology is there. It will connect you to an interpreter on the line that’s already paid for. One thing that helps overcome fear is to start praying for the Deaf before you reach out. As you pray, God can stir compassion and grant humility needed to engage. Pray for Gospel opportunities with your Deaf neighbors and for the Lord to give you wisdom in outreach.